Perfectly situated a stone�s throw from Canford Cliffs village with it�s eclectic mix of luxurious salons, patisseries and restaurants, Nairn Road is just a short walk from the award winning Blue Flag beaches of Sandbanks. 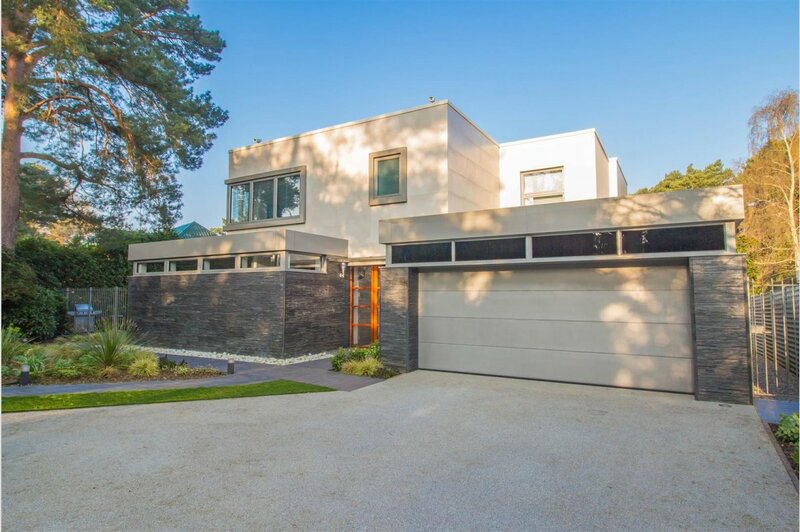 14 Nairn Road sits comfortably on a � acre plot neatly cut into the landscape to make the most of the stunning rear aspect of mature woodland leading to direct access to arguably the finest golf course in the South. Architecturally designed by renowned architect and interior designer James Sims of JSA Design based in Palma de Mallorca the property�s Mediterranean roots are clear, with it�s 2,500 sq ft of secluded terraces and 6,650 sq ft of living space wrapped in an exterior of exquisite maintenance free Porcelenosa tiles. With vast walls of glass opening on to private terraces lined with mature olive trees and bamboo, the property offers the perfect indoor/outdoor mix of living. Whether entertaining from the commercial grade catering kitchen, or quiet family meals out in gardens designed by award winning garden designers, 14 is the ultimate in flexible modern family living. 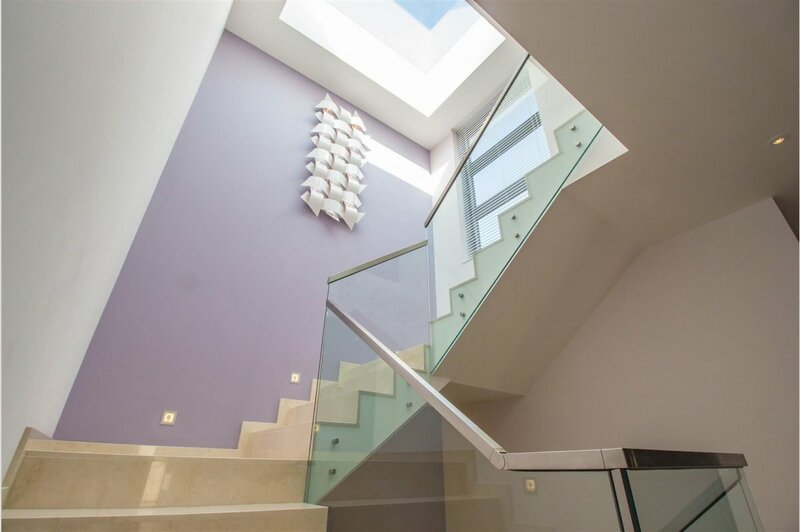 With a lift accessing three of the four floors, this property feels more boutique hotel with every step, yet still offers truly flexible family living, a home that can flow as one, or be easily partitioned to accommodate growing families or aging relatives alike. 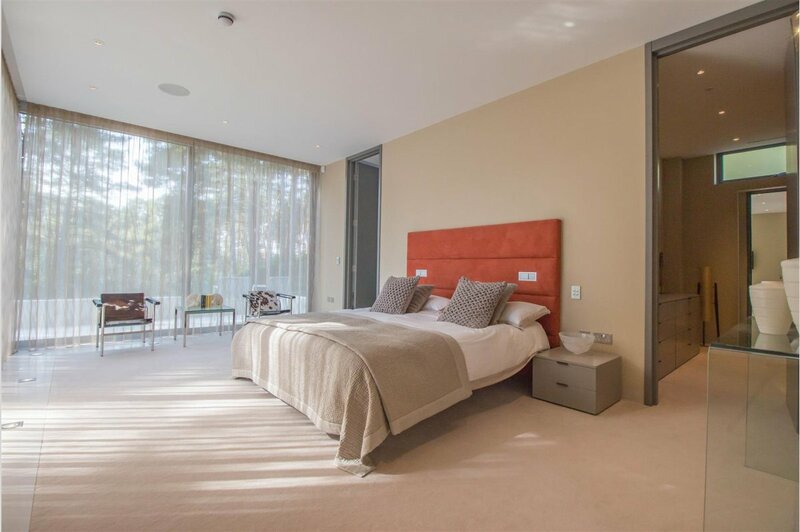 Every detail of this spacious, minimal yet comfortable interior has been considered to exacting standards, from bespoke full height metal doors to concealed surround sound, pure white Silastone work surfaces to intelligent lighting, cushioned gymnasium floor, 7ft cinema screen and a bespoke 390 bottle wine cellar. 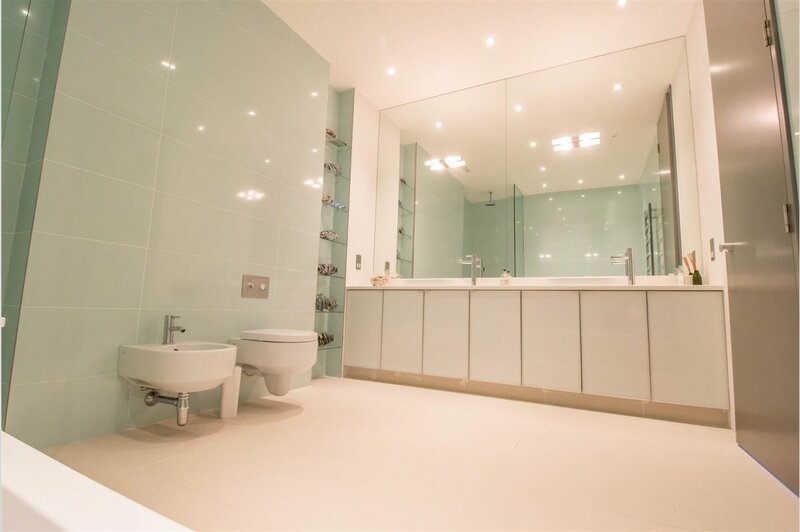 Appointed with 5 sumptuous well proportioned bedroom suites featuring bespoke Italian MisuraEmme fittings to the large attached dressing rooms, each bedroom�s generous ensuite is equipped with luxurious Porcelenosa sanitary ware, tiles and fittings. Two suites are fitted with smart TVs. All suites are fully wired for AV including integrated KEF ceiling speakers. Technology is paramount with this home. Every possible detail of 14 Nairn Road can be controlled by iPad via the Clipsal home automation system over a static IP address to ensure worldwide access to the comprehensive system installed by local company �Living�. 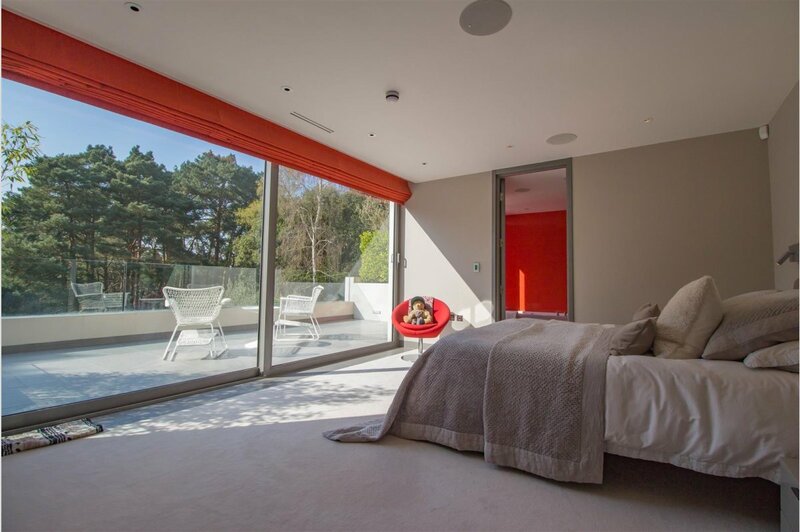 From remote blinds to TVs, lighting, heating and CCTV, control of the house is at your fingertips wherever you are. Maximum possible insulation ensures this house will barely need the wet under floor heating system that spans the entire property, whilst the 4 separate plant rooms keep the state of the art laundry room, two separate steam rooms, three Jacuzzi baths and sauna ticking over nicely. Remotely controlled gates provide secure access to the resin bonded driveway with parking for two cars leading to a luxury double garage. 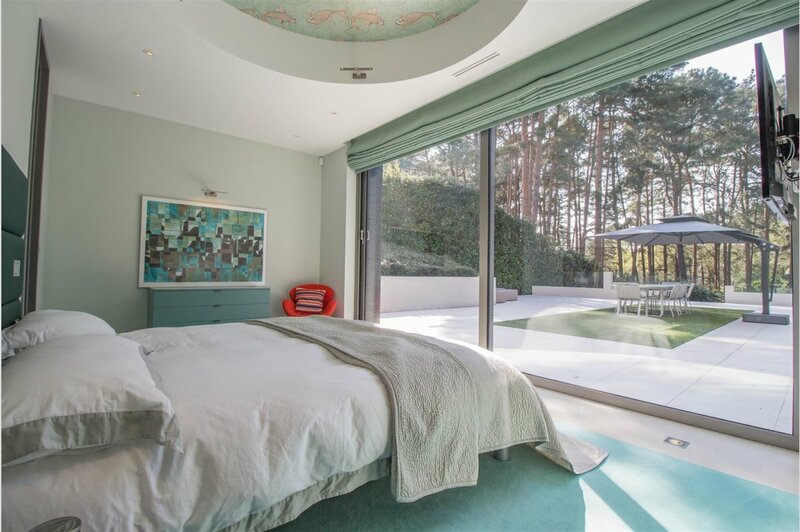 Views from the rear aspect provide a secluded retreat down to the 11th hole of Parkstone Golf Club. A variety of terraces make up 2,500 sq ft of luxurious outdoor living space. The bespoke formal kitchen is wrapped in pure white Silestone work surfaces with integrated Siemens appliances. Behind the main kitchen is a separate stainless steel, commercial grade catering kitchen with Capel oven, Siemens dishwasher, ice machine and it�s own entrance and access to terrace, perfect for entertaining friends. The formal lounge has a feature wall of Italian tumbled silver travertine with inset gas fireplace. The family room features a further kitchen, integrated smart TV and access to the master suite. Each of the bedroom suites features fitted dressing rooms by Italian furniture maker MisuraEmme and Porcelanosa ensuite bathrooms. A shower room and 5-person sauna are accessed via the gynasium. 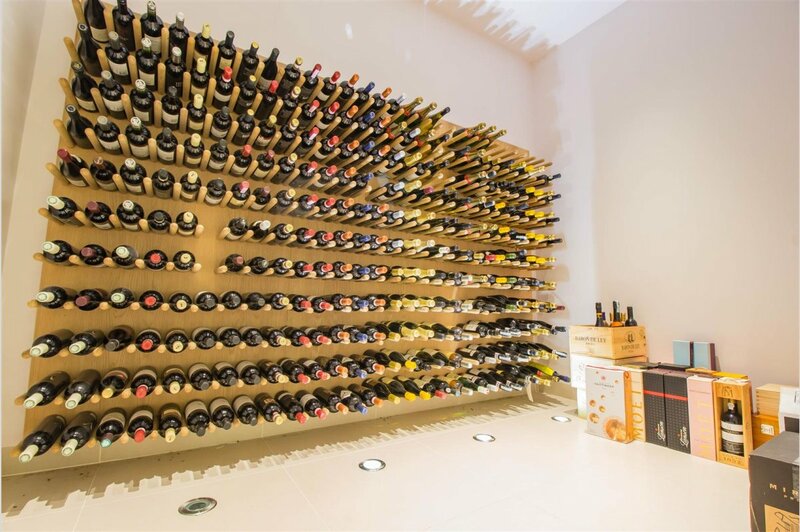 A bespoke design by the architect, the wine cellar has enough room to house 390 bottles. Fully wired for AV, with stunning views of the grounds beyond. Fitted with Porcelanosa tiles and sanitary ware, the master en suite features a large walk-in shower/steam room and Jacuzzi bath. 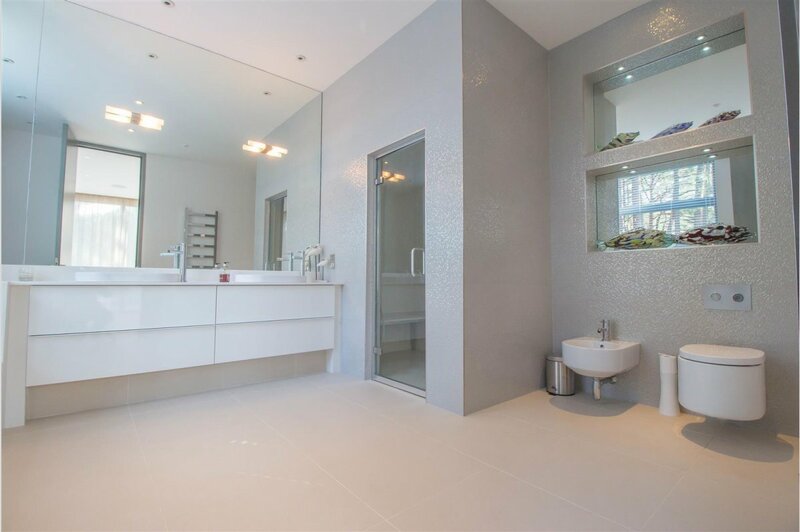 Porcelanosa tiles and fittings feature in all bathrooms and WCs. At the heart of the home, the formal lounge is luxuriously appointed and opens on to a private 700 sq ft terrace. 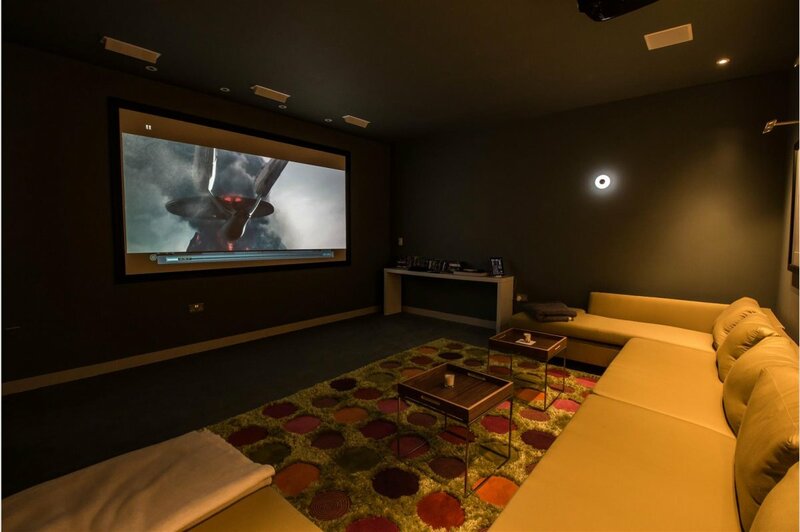 The cinema room features a fully integrated 7.1 surround sound system with an Epson 3D/HD projector and a 7ft screen. 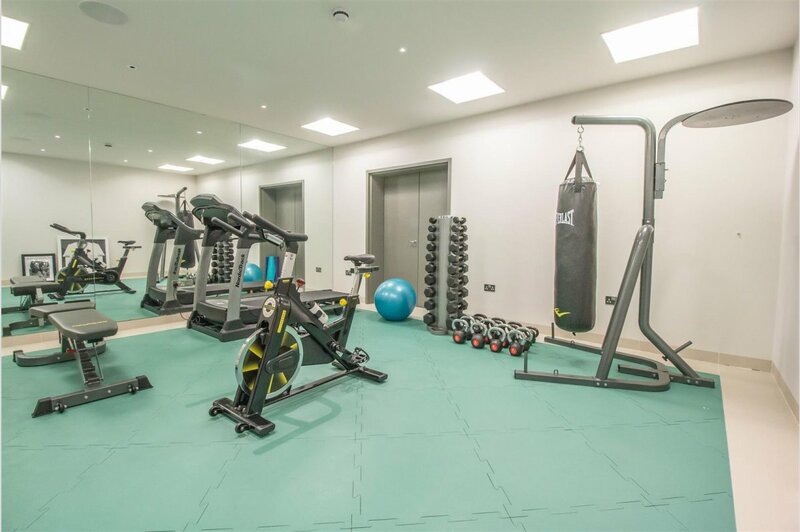 The spacious gym features a full length mirrored wall, rubber flooring and a smart TV, with direct access to the changing room and sauna. A generous lift provides easy access to three of the four floors. 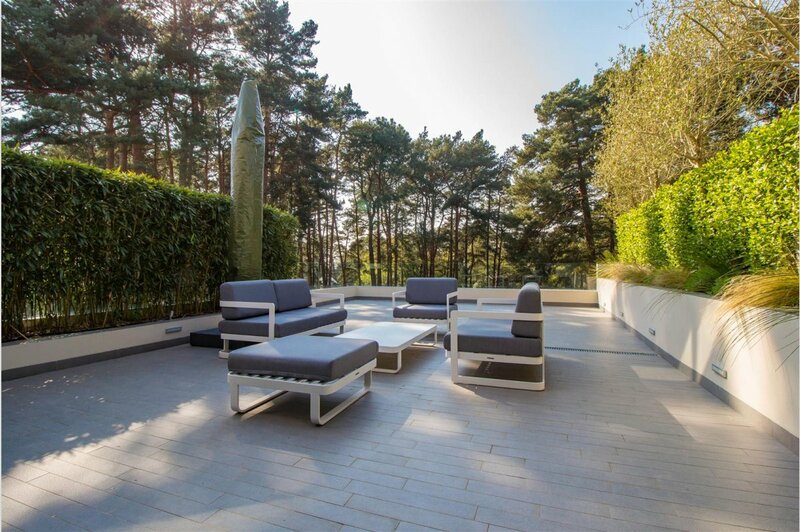 Mature planting envelopes the secluded terraces creating the perfect evening retreat. The home comes with a full 10 year NHBC build guarantee.